Eight days ago, I pulled some warm season plugs from three different types of warm season turf grass here on the property. 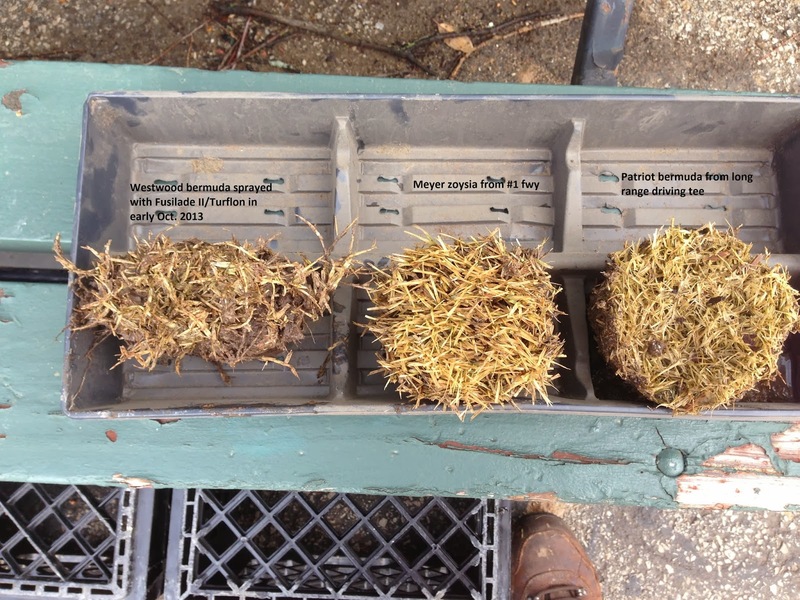 Old picture first, updated picture in the middle plus a close up of the zoysia plug on the bottom. The Westwood bermuda that was sprayed with Fusilade II is looking very rough. 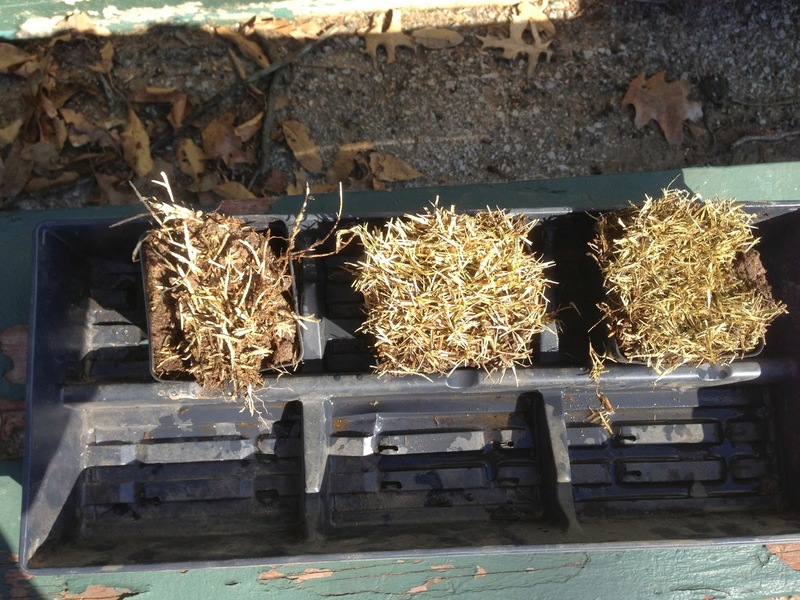 The middle plug is Meyer Zoysia and the leaves are beginning to grow from the crown area of the plant. The third plug is Patriot bermuda. I cannot see any green up at this time in the Patriot but it normally is slow coming out in the spring. Close up of zoysia leaves emerging from the Meyer Zoysia plub. In late fall, Andy Reistetter set out on a journey from the last Gold Medal Matches in Olympic Golf here at Glen Echo CC to the next Olympic Golf Gold Medal Matches in Rio in 2016. Andy just posted a nice story on his blog with pictures, interviews and information about his first stop @Glen Echo CC. Course will open Saturday, February 22nd! The course will open on Saturday, February 22nd! Still some moisture coming up on greens as we clean them up this afternoon but should continue to drain and be okay to open Saturday. We are picking up debris but still many sweet gum balls, leaves and sticks on various parts of the course that you will encounter. All course supplies are still stored for winter with some very cold temperatures coming in this coming week. We will begin to move these products out on the course after this next blast of winter weather. Enjoy your day on the course! The greens have become frozen again at the surface from the drop in the overnight temperatures. I would expect when the greens begin to thaw today that conditions will be too soft and wet to open for play. We will be checking out all the greens this afternoon once they thaw to get a better handle on the conditions for a potential opening on Saturday. The freeze has moved down through the sand layer so we are in good shape when it comes to not shearing off roots between the freeze and thawed line. We did receive .38" of rain yesterday which does need to move through the green profile to insure that the greens are not like sponges with water coming up from each step and deep foot printing impressions are not left on the surface of the greens. As always I will keep you updated regarding the potential for opening the course for play. 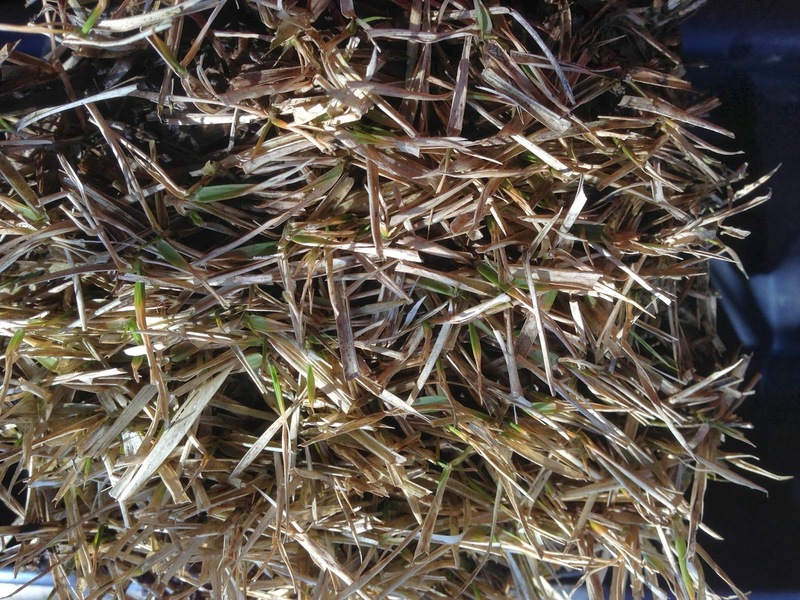 Warm season turf, has it survived the cold winter season? I think most of our warm season turf should survive this past winter but I'm doing a plug check in the window of the office just in case. Some of my peers to the south are keeping their fingers crossed hoping the bermuda greens that were hit with severe cold this winter were not severely injured. Our zoysia turf is rated well below freezing for winter kill potential but our bermuda turf that contaminates many areas of our property could have been injured. That is not necessarily a bad thing but if you lose too much turf at once, it could create some voids in our key areas such as fairways, green surrounds and tees. Also, our long range tee has a bermuda grass that is known for cold tolerance but I have noticed it slow to grow in the spring following a colder than normal winter. I do expect the bermuda in the fairways that I sprayed as a part of our bermuda eradication program to wake up at a slower rate than the non-sprayed areas. The spray applied in early October right before dormancy injured it and the colder temperatures should have pushed this injury even further. There were seven acres of fairways sprayed with this material. I would expect these areas to delay in greening up. As they begin to emerge and there are larger areas of zoysia in some of these sections, I will probably spray them again delaying there growth further and allowing the zoysia to begin to fill back into the area. With The Invitational(Member/Guest) Tournament occurring the 2nd weekend of June, I will be working the spray application timing before and after this event to insure we have the best possible conditions for the event. A word of warning to warm season turf owners. Do not get in a big hurry this season to do anything to your turf until it begins to green up and require mowing. Fertilization should always be delayed until you are sure all large patch on zoysia/bermuda is not actively growing. Usually mid to late May in St. Louis at the earliest. Dethatching a warm season lawn should be delayed until the lawn is actively growing and needs mowing. Performing these type of practices too early to your lawn could injure and allow for the emergence of summer weeds. Warm season plugs from left to right. 1. Westwood bermuda from 1 fairway sprayed with Fusilade II/Turflon in early Oct 2013. Stems are slightly green. 2. Meyer zoysia fwy plug from #1. There is green leaves showing and green in the crown. 3. Patriot bermuda from the long range tee. Stems are smaller than westwood but do seem viable, slightly green at this time. The course will remain closed today after checking a number of greens around the course. From what I have seen today, I will expect the course to remain closed on Friday. We will evaluate the course on Friday for the weekend. I've attached a couple of videos to help you see the conditions for yourself. 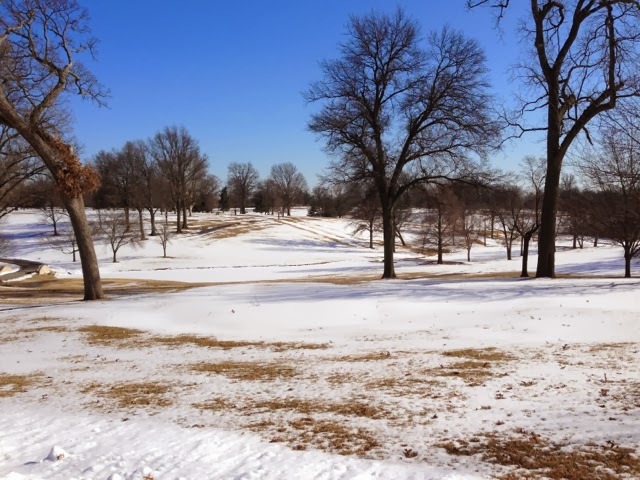 We appreciate your patience as the course thaws out from the cold and snowy winter. The staff are working on splitting the big logs from the fence line oak from 12 tee. 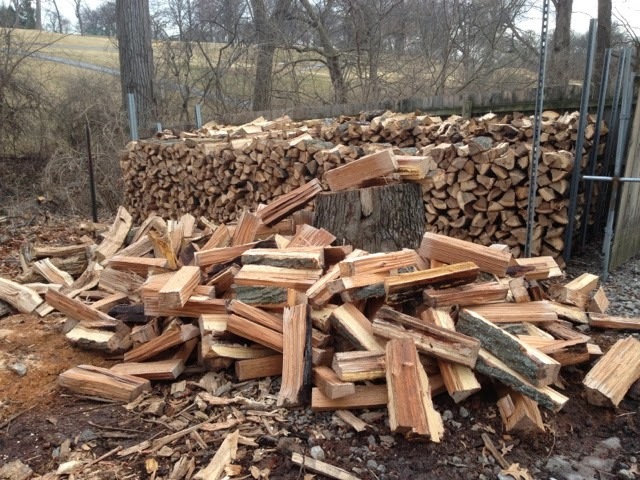 Huge logs that take some extra effort to split but a lot a great wood for next winter. 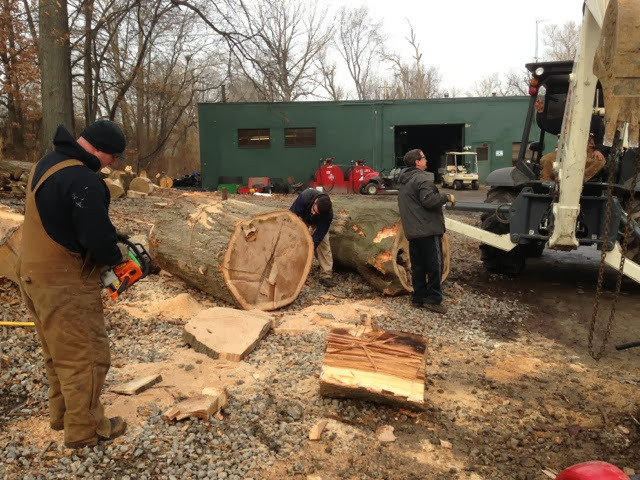 The staff cutting the large logs to split. The finished product waiting to be stacked. I did a short video after lunch today to demonstrate the depth of the freeze layer in our greens right now. Wednesday February 19, Course remains Closed! The course is still closed as the thaw comes out of the greens and the remaining areas of the course continue to drain water away from the surfaces. Our efforts in keeping the course closed at this time will give our greens a better start for the golf season as more reasonable golfing conditions become available to our members and guests. Our goal is to get our course open as soon as possible without sacrificing the long term health of our greens. Damage our turf now and we could face very sone very daunting circumstances this summer when the hot weather arrives. Nice weather for a few days but we are not close to opening the course as of yet. It will take some significant thawing to allow the moisture to get through the profile. Rainfall could be helpful to push the freeze out of the soil. Practice green with melting snow staying on top of the green because of the frozen profile. 11 green one of a number of greens still covered in snow and ice. The Harrison Bay Bald Eagles from Tennessee are beginning the arduous process of hatching and fledgling two more Bald Eagles. 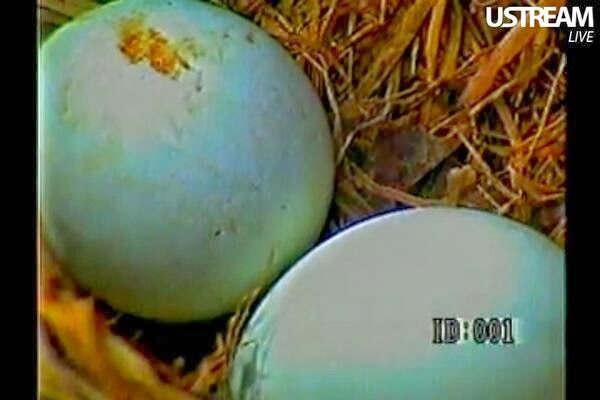 Eggs were laid a few days ago and should hatch around March 17th. Even though this is occurring hundreds of miles away, these beautiful creatures deserve our attention during this process. Nice learning experience for the kids and grand kids. Poor girl was covered in snow the other day. Dedicated parents! Save the link in your favorites for a view from time to time. Warming temperatures are helping with snow melt but more snow is expected over the weekend. There will probably be no opening of the course this weekend. With the ground being frozen, the melting snow cannot drain through the profile. I will make another post after the weekend to inform you of our current conditions. Produced a little video this morning as we have started to tap our maple trees here at Glen Echo. The sap is collected and boiled down to the highly concentrated natural maple syrup that Chef Terry uses in various dishes throughout the year for our members and guests at Glen Echo CC. Today, we contracted with Gamma Tree to remove a damaged tree along the cemetery fence line near #12 tee. This tree had lost half of its canopy in a storm and was in need of removal. Since it was near a fence and was over 70' tall ,we hired our tree company to do the work. Many trees develop poor crotch angles which is the angle between the main trunk and a side branch. The wider the angle, the more stable the growth and balance there can be between the trunk and branch. Less than a 30 degree angle between the trunk and side branch would be a general rule of thumb to use in determining if a tree would have a bad trunk to branch angle. These tight angles should be removed when the tree is young to allow the canopy to grow properly. Once the tree continues to grow and these side branches become massive, large cracks can occur in the angle area and in many cases are not visible. Water gets in these cracks and can expand the crack larger from freezing and thawing action. Insects such as carpenter ants invade and can damage or weaken the area. Disease can also enter through the wounded area. Once the area is weakened sufficiently, all it takes is strong wind blowing in the proper direction for the tree to lose part of its branches or snap off part of the trunk. These areas sometimes are not visible to the naked eye but other times they are visible and when we notice a potentially dangerous situation, we will remove the branch to save the tree. On many occasions, the damage is too severe or the tree is out of balance and can pose a risk if it is not removed. The wood will be cut up by our staff and will be split to be sold next season and will also be available for us to use to heat our maintenance building in our wood burning stove. Gamma tree beginning the removal of the tree from 12 tee. 1/2 of the tree was blown off in a storm. The 1/2 that hung over the cemetery was blown off. The wound is about 4' in area in the middle of the main trunk. Gamma tree removing the limbs from the large oak behind 12 tee. Down to the totem pole. A little noisy from the chipper but a video explaining how our contractor is removing the tree limb by limb. As I type this blog post regarding the potential of opening greens, more snow is falling. I guess it is timely since the Winter Olympics are taking place in Russia. 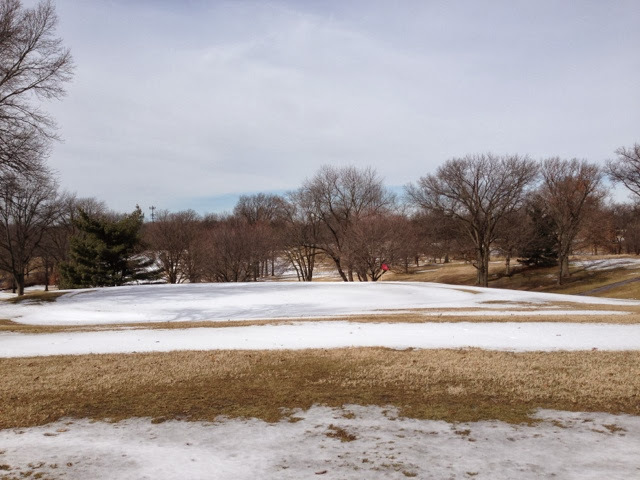 With warmer weather approaching this week and the potential for the snow to melt away from the golf course, I thought I should make a post regarding the opening and then possibly closing the course during some moderate weather over the next week or two. Our greens will begin the transition from frozen and hard as concrete to potentially mushy and partially frozen sponges that are living and breathing. 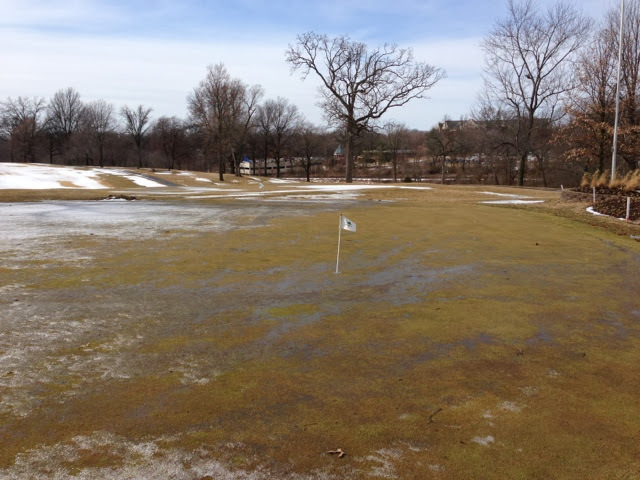 During the winter, it is my hope that our golf greens stay either completely frozen or completely thawed. Where I see the biggest potential for damage to our greens is when the surfaces are soft and the profile of the green is still frozen an inch or two below the surface. Foot traffic can cause roots to shear at the interface between the frozen and thawed area. Regeneration of these root systems take time throughout the spring and potentially into the summer to heal. Significant energy is used by the plant to heal itself. What we hope is that the root systems stay intact and begin to grow and branch as much as possible. As the roots branch and increase in mass, root hairs in the billions can form along a healthy root. Damaged roots produce less root hairs and reduce the plants ability to produce energy for the plant to use. The primary function of the root hair is to absorb moisture and nutrients into the main part of the root system. Plants that are producing more food than needed to keep the plant alive then place this material in storage within the plant stems and crown area. The plant uses this material during periods of poor production brought on by severe weather related stress during the summer. The greater the reserves the plant has, the more energy that it has available to use during these extreme weather conditions when production is very low. Besides root shearing from greens partially thawed but frozen underneath, greens can be full of water like a sponge. The greens will begin to thaw on the surface and remain frozen below the surface. Water can build up on the surface because it cannot penetrate through the frozen profile. Earlier in the winter season, we were forced to keep the course closed during a relatively mild temperature outbreak because of the sponge like affect we had on the surfaces of our greens. During this time, foot printing can be become very prevalent as well. The greens are soft and a foot prints can stay on the surface of the green for many days. Too many foot prints from multiple players could lead to the green being very bumpy and virtually unplayable plus the potential for unseen damage in the profile of the green. As temperatures moderate and the snow leaves the golf course this week, we will be monitoring conditions for potential problems. We might open the course for a day or two but then be forced to close it again if conditions warrant to allow the greens to thaw properly. I will keep you informed regularly through blog and twitter postings as conditions warrant. We appreciate your understanding during this most difficult weather situation. Our focus is to have the course come out of winter unscathed with its greatest potential for growth and healthy conditions occurring during the green growing season from March through difficult conditions this summer and into November of this year. Well, we can't play much golf in this type of weather so I thought I would take a few course shots of the snow covered features. Airport only recorded 3.3" so as the weather begins to warm, snow should melt in quick order. Those of you that receive email's of the blog might notice an alignment problem for the the weather stats post I made yesterday. Cutting and pasting does not seem to line up properly when blog posts are sent out through emails. Sign in to the blog on the web if you would like to see the post in its proper format. Sorry for the inconvenience. The weather stats for January are not pretty so lets look at them very quickly and move on. Average temperatures well below normal, rain fall totals lower but snowfall well above average. We needed the moisture but I'm not sure how much moisture made it through the soil profile. Golf course management did a quick hitting article regarding our Maple Syrup production here it Glen Echo. Check out the link below. Pages 20-22.